Worked to protect my ethernet cables from spinning blades of doom by encasing them in pipes where my sister wants to mow. Just as I was getting into the creek for a dip, a hawk (or similar) flew down the creek through a tangle of trees and almost into my face. We were both pretty startled. Got in a splashing war with a dog. Lucy is capable of swimming out into the creek and splashing water three feet high, right at you. We had way too much fun, and now I think one of us is smarter than I'd thought, and the other, perhaps sillier. Got home to find a huge box from Amazon. 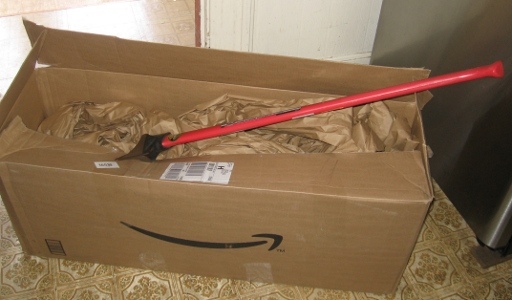 Hmm, I hadn't ordered anything from Amazon... Double hmm, the inside was just full of packing paper... Yipes, there's a big red axe buried in here! Thanks to Iain M from Melbourne who writes, "We have never met. I have used your software and gained insight from your blog, over the years. So thanks. Also, I have never bought someone an axe before. This is cool." I forgot I had that in my wishlist, but now I can split wood with ease, when I run out of Amazon packaging material to burn. Your software has helped my over the years as well, as has your blog. Hopefully I'll buy you something from you wish list one day. It won't be a big red axe though.